The key to beautifully arranged shelves is variety. Fill some shelves with books (don’t forget to switch between lining them up and stacking them) and fill the rest with art, objects, and houseplants. 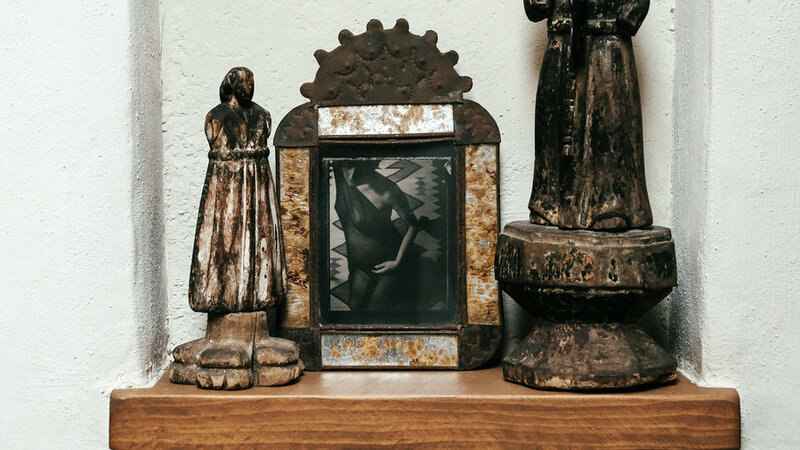 Focus on letting each collection of items tell a story—the baskets you picked up on your latest trip to Mexico, or your love of black and white historical photos. Above all else, shelves are storage, so don’t be afraid to fill every last corner with books, artifacts, or spare vases and vessels. There’s no shortcut to this: You’ll have to play with arrangements and the balance until you like the overall look. But don’t forget to sneak in some woven baskets for a place to stash the less-pretty items. 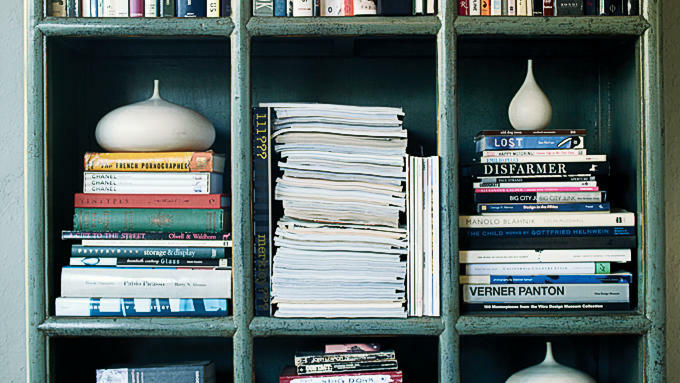 Uniform stacks of books are an easy way to fill decorative shelves in main living spaces. 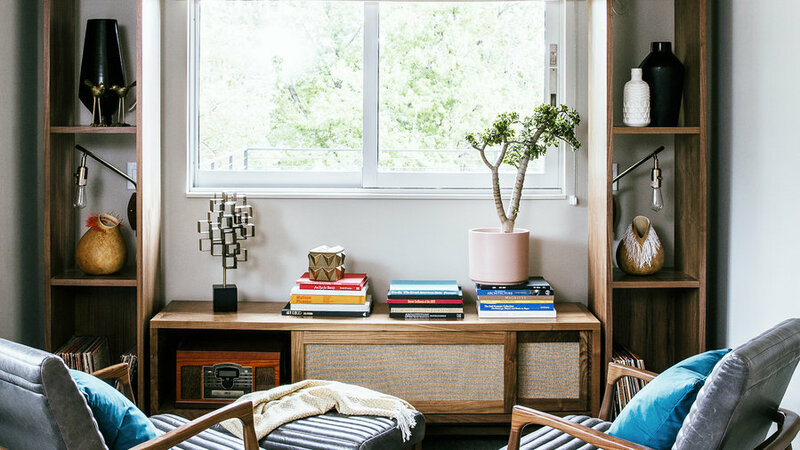 Add a little bit of extra interest with vases or objects on top of a few of the stacks. This is also a good strategy if your library is a little meager. 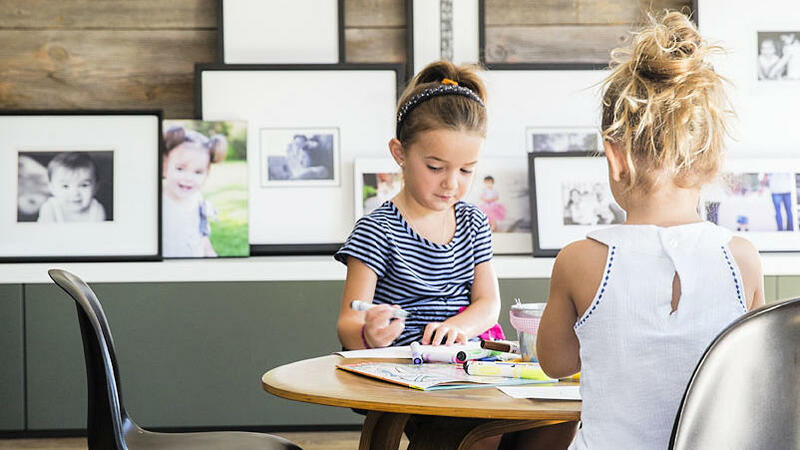 We’re loving this alternative to a wall of family photos: Lean them on a low shelf where they’re easy to switch out as their subjects grow. The key to this casual look is different size frames overlapping one another. Don’t underestimate the power of multiples and consistency. Everyday white dishes look like a still life painting when grouped together in this vintage glass-front cabinet. 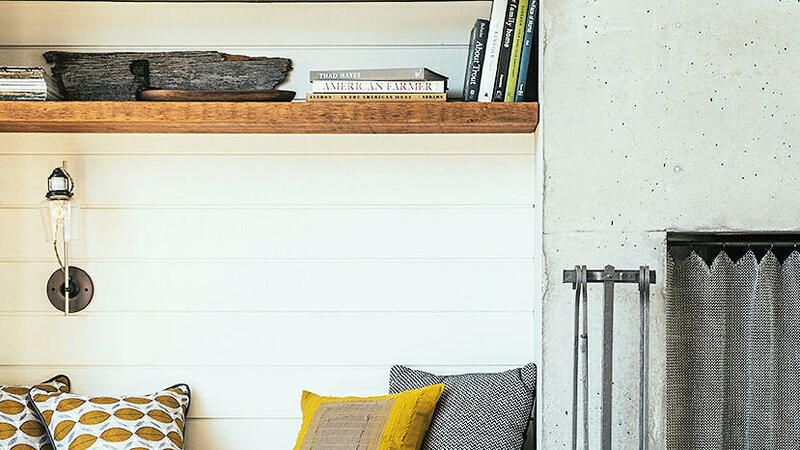 Floating shelves provide display space in previously forgotten spaces, like this seating nook. Since these command a lot of attention, be artful with your choices: photo books, unique souvenirs, and anything that could start a conversation belong here. 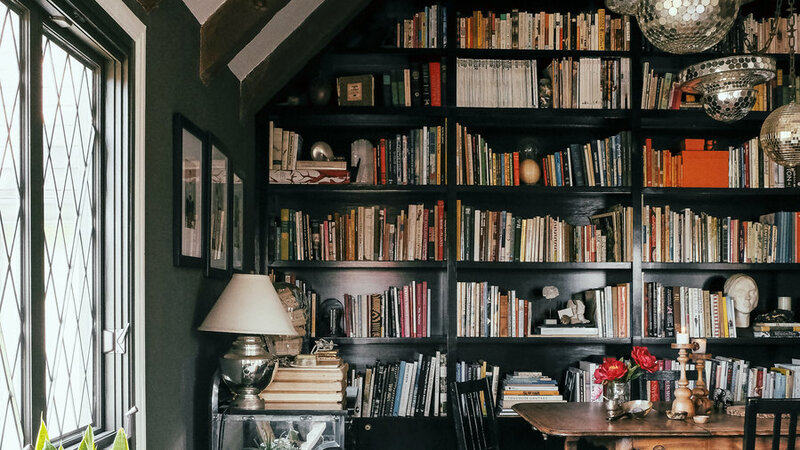 A dark bookcase—either painted or with a dark stain—shines a spotlight on its contents as a whole, so think of them as an architectural feature. 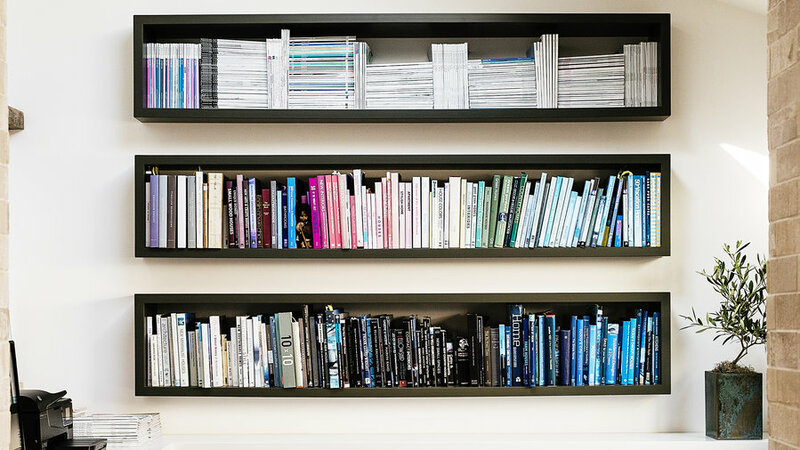 Line up black bookshelves, either built-in or stand-alone pieces, to add a focal point to a room that doesn’t have one. In contrast, white shelves are like museum displays—they put all the focus on the individual pieces within. 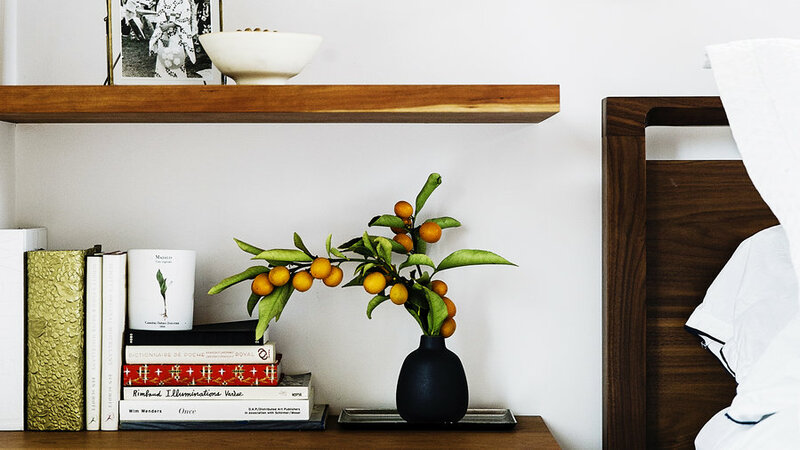 Play it up by placing a single standout piece on a shelf by itself. Look closely: These custom shelves conceal a drop-down desktop (with a printer and cords hidden underneath) and a panel to cover the flat-screen when it’s not in use. 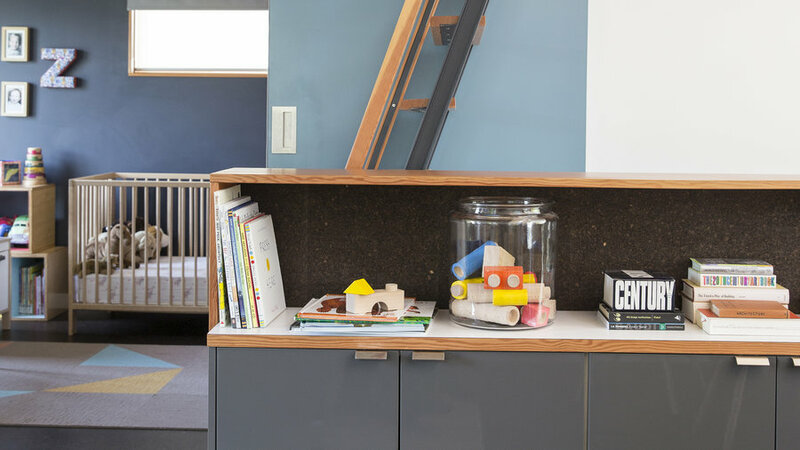 In a kid’s room, shelving books by color is a fun way to teach the hues—and the arrangement can turn all those tiny, clutter-prone volumes into a lovely decorating feature. 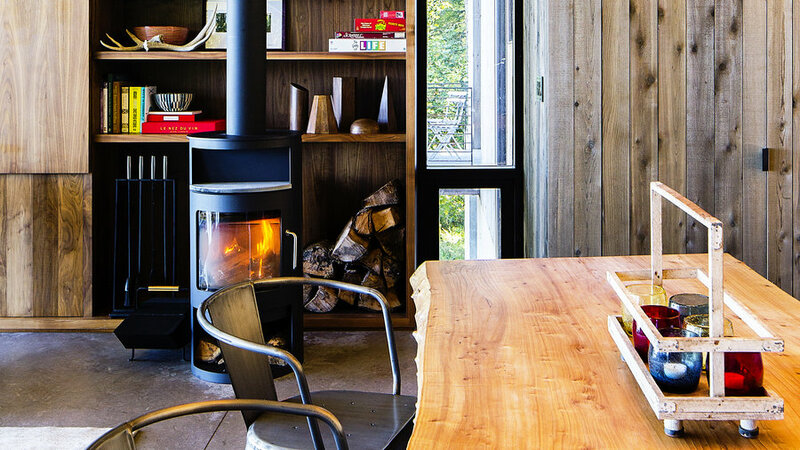 The varying shelf heights in this custom piece allow for practical storage of fire pokers and firewood (lay felt down to protect the finish) on the lower shelf, and books and objects above. 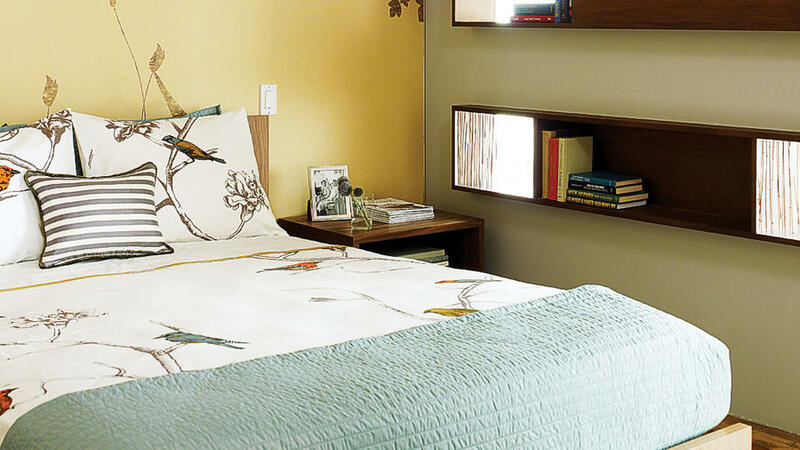 Bedroom shelves can be tricky: Too much stuff and it ruins the serene vibe you crave for good rest. Put your most personal items on display and let them speak for themselves. The visual quietness will feel just right. Row after row of shoes aren’t only practical—easy to spot the best option for an outfit—they’re beautiful. 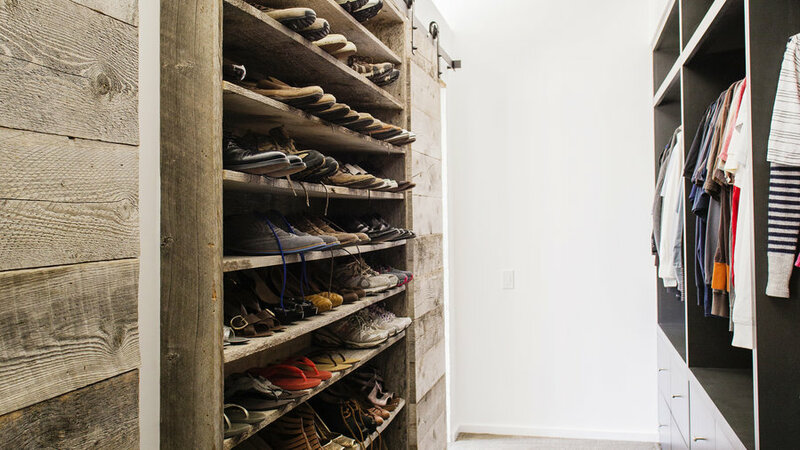 The open shelves turn this pass-through into a luxe master closet. 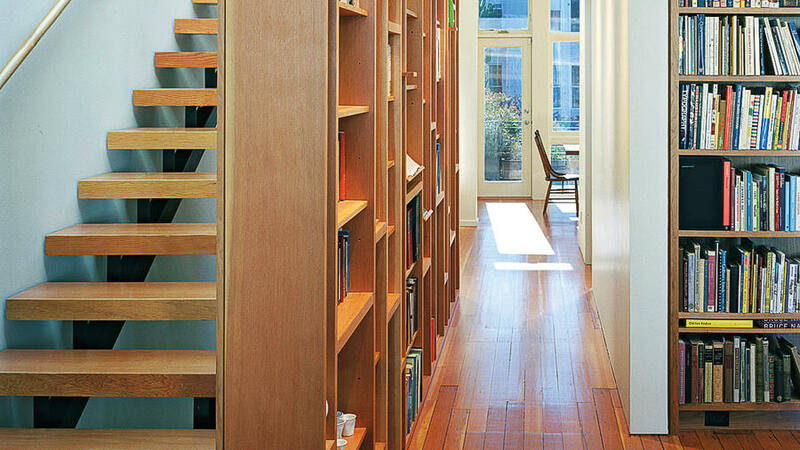 Long niches handsomely hold the reference library in this home office. The shelves are almost flush with the wall, leaving room for cabinets below. A bank of cabinets divide the stairway from the dining room in this house, but it’s the covered shelf above that gets an A+ for space use. The wide open shelf hides paperwork and craft supplies out of sight. A palette of ivory, indigo, and naturals helps these eclectic shelves look pulled together. 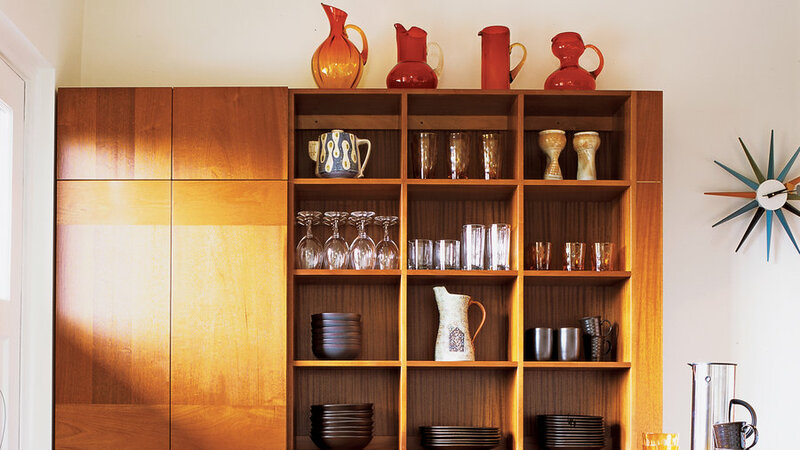 If your shelves are a blonde wood tone or white, choose deeply colored objects that contrast. 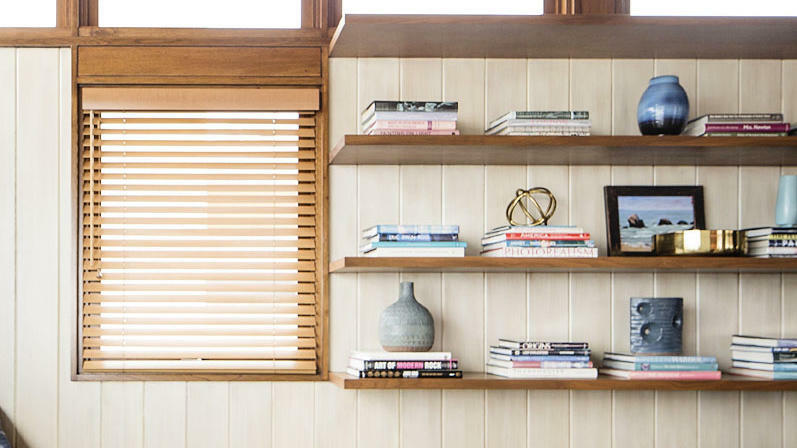 The slender proportions common to mid-century modern architecture inspired this shelf—and the slats it bisects. The fringed gourds show the power of the rule of three: Group accessories in trios to make them look like a collection. 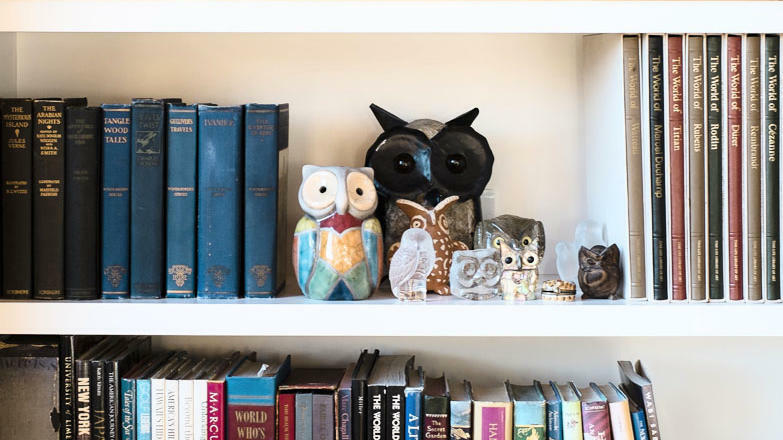 Quirky collections—like the owl figurines here—are just the thing to break up a book lineup. 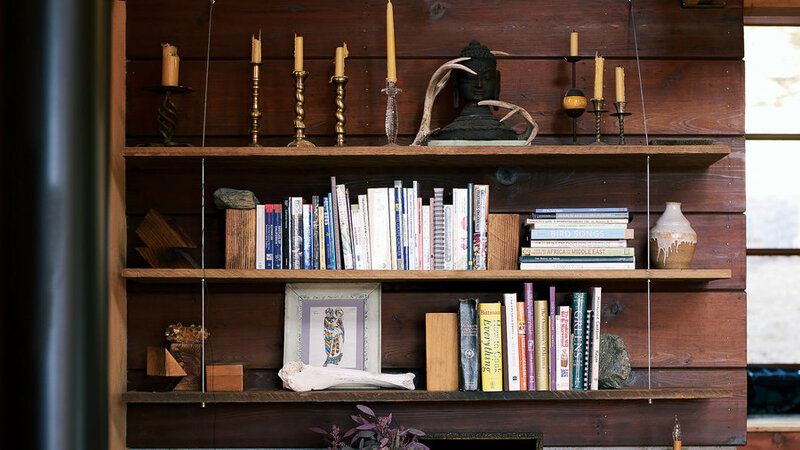 But this eclectic shelf illustrates another key concept to a polished shelf: Pull books to the front of the shelf. Crates climbing up the wall add another dimension to this living room, plus the chance to mix hung art in with the boxes. 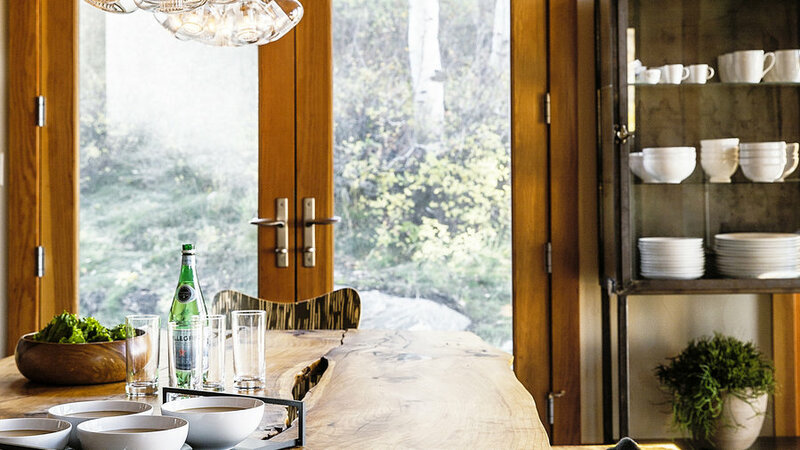 Clever thinking led to carving out shallow niches beneath this window. 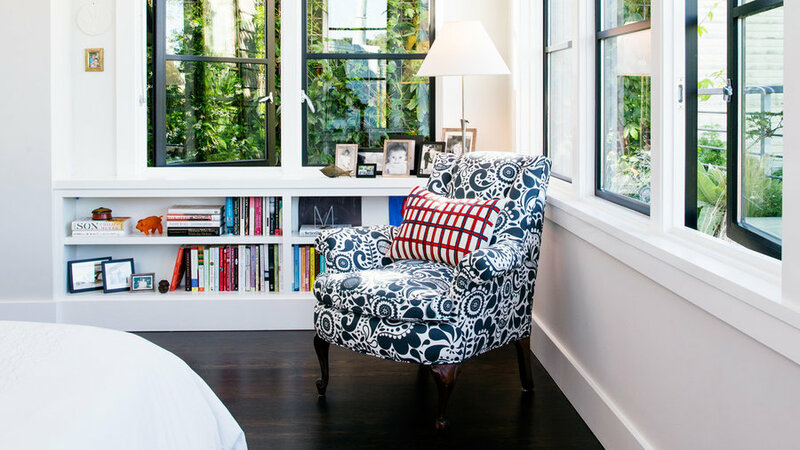 The shelves don’t take up any room in this cozy master suite, and the addition of a chair and lamp turns this corner into a mini library. 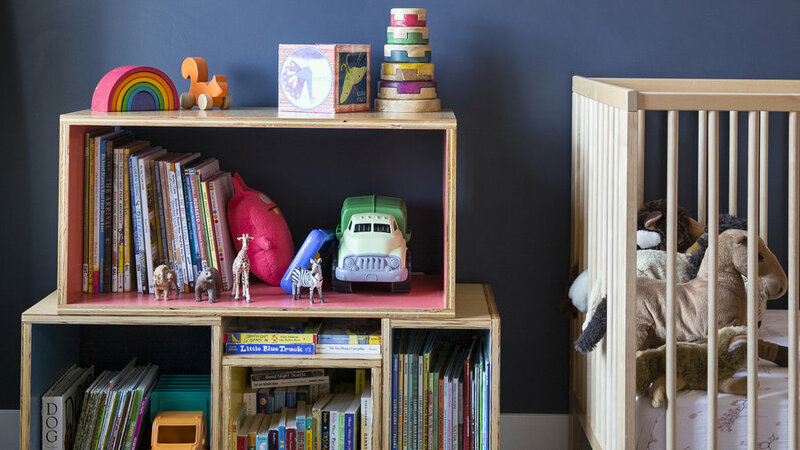 Stacked colorful crates provide flexible storage for this nursery. As the child grows, they can be rearranged, upended to use as a small table, or flipped to use as a basket. Staircase walls are notoriously difficult to deal with: If you hang photos, how do you line them up? If you paint the wall, does the color look equally good on both levels? 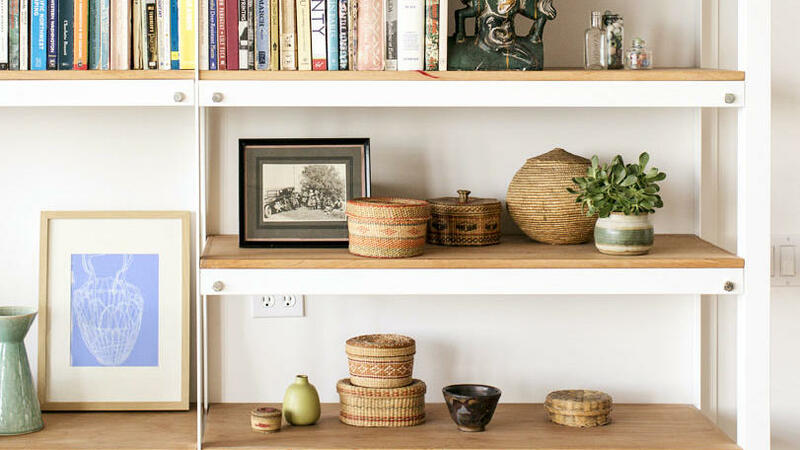 Shelves make it easier—and create extra storage space. 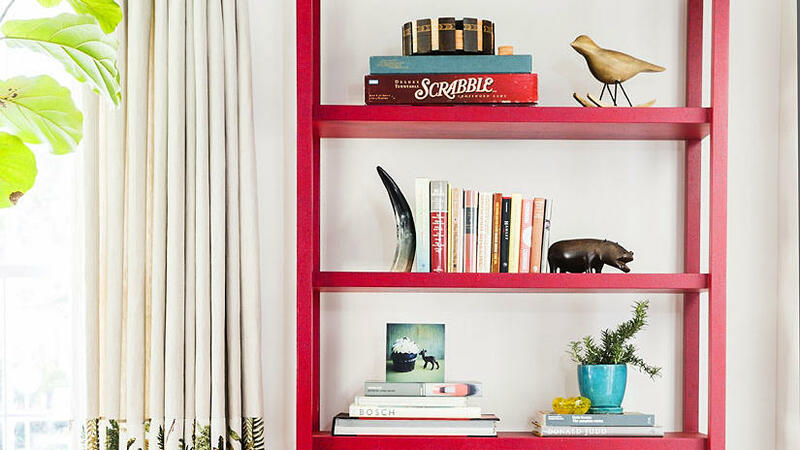 A cherry red bookshelf is like a shot of energy in this traditional home. The strong color acts like a frame for its contents, so give them some extra love with interesting bookends and small houseplants. Striped wallpaper on the back wall of these shelves gives these lofted shelves even more character. Try repositionable wallpaper if you’re afraid to commit to a design. A combination of a low credenza and two slim bookshelves almost perfectly fills this wallspace, mimicking the look of built-ins. Go ahead, push the sofa against those shelves. It’s like a headboard for your couch, providing a focal point, avoiding the whole Is this art big enough for over the sofa? question, and providing storage on top of that. A teeny tiny shelf calls for a really special something. Display an item that has a personal story behind it, because inevitably people will ask for one. 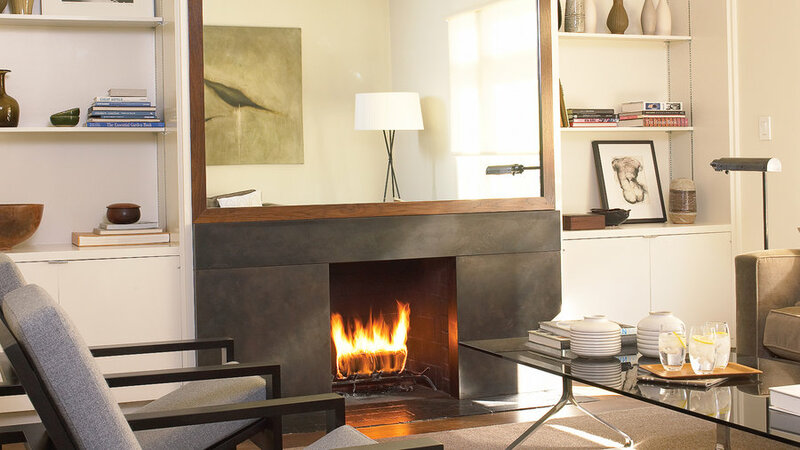 Extend built-ins to create a frame for the door or adjoining room. Take advantage of all that space by displaying photos, art, and some well-chosen trinkets among the books. White paint keeps a book-filled wall from feeling heavy. 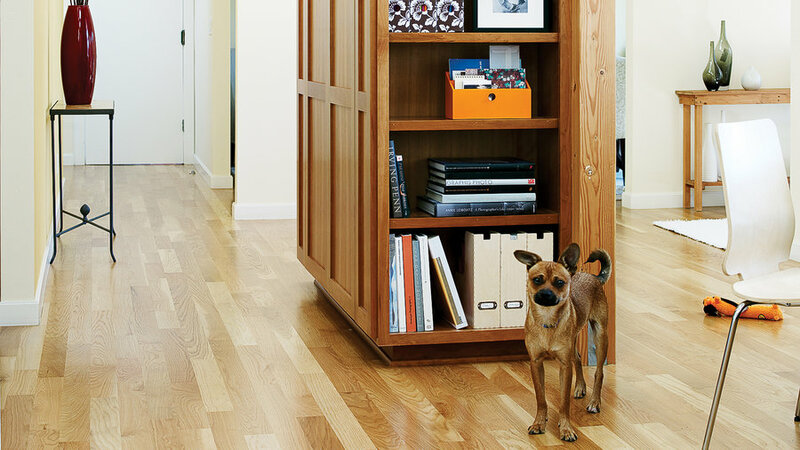 A single shelf in an unexpected place can expand your storage right where you need it most. This one in front of a kitchen window frees counter space and keeps cooking ingredients handy. Colorful often-used items are grouped together for a visual display on top of an antique cabinet. Cooking utensils, beans and spices, small tools, and a chalkboard for posting reminders lend warmth. 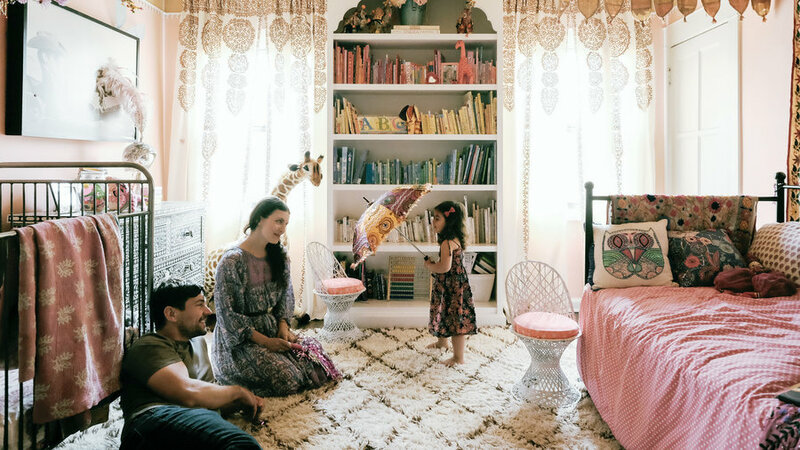 Rather than filling her shelves with books, L.A. designer Kelly LaPlante left room for shapely objects and empty space to create a pretty display. "I first visually balance the case as a whole," she says. "Then I arrange the contents of each shelf." See more of her place here. 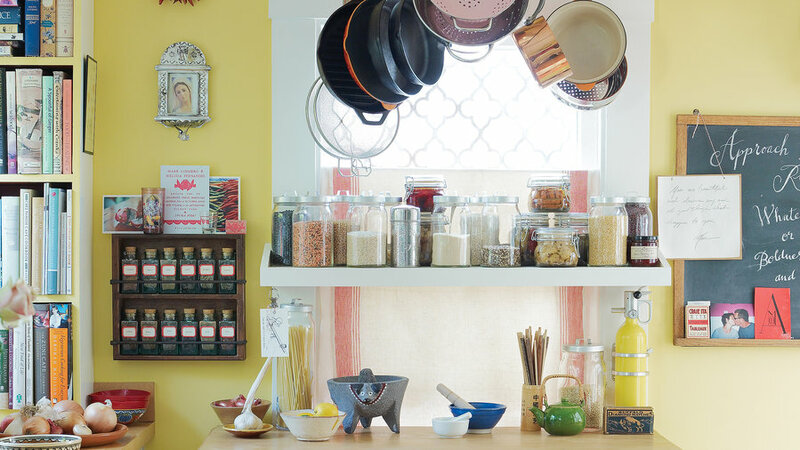 Open shelves can look cluttered. Unite unruly stacks by showcasing a collection of objects of similar shape and color. Even the most haphazard piles will seem intentional. Keep horizontal stacks on lower shelves to prevent them from looking precarious. Cubbies are ideal for storage and display―and are easy to stack and rearrange. Cubes $60 and $80 from Stumasa. Office Basics accordion-style organizer $36; seejanework.com. Her small San Francisco home didn’t have space for a home office, so Sara Menuck converted her living room closet into a chic, streamlined workstation. Design Paris Renfroe Design; parisrenfroedesign.com; 651/233-0063. 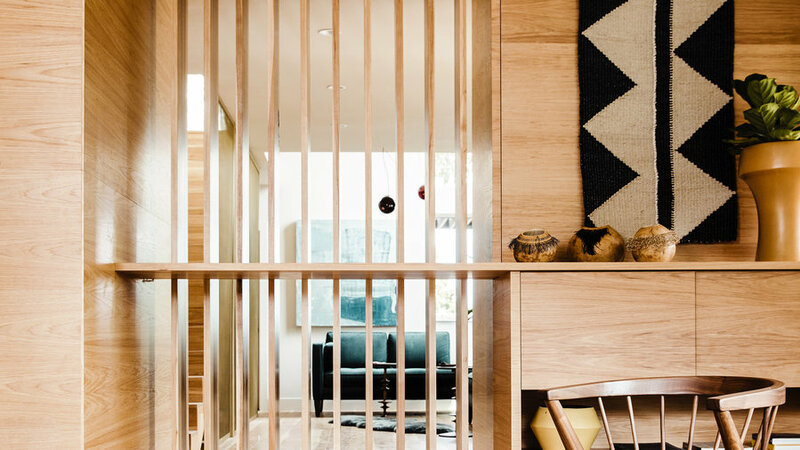 With storage and display shelves resembling large egg crates, the simple wall system shown here defines the kitchen, dining, and living areas of this California cabin, and keeps everything in plain sight. The ladder leads to a loft, and the inside of the box actually houses a bathroom. 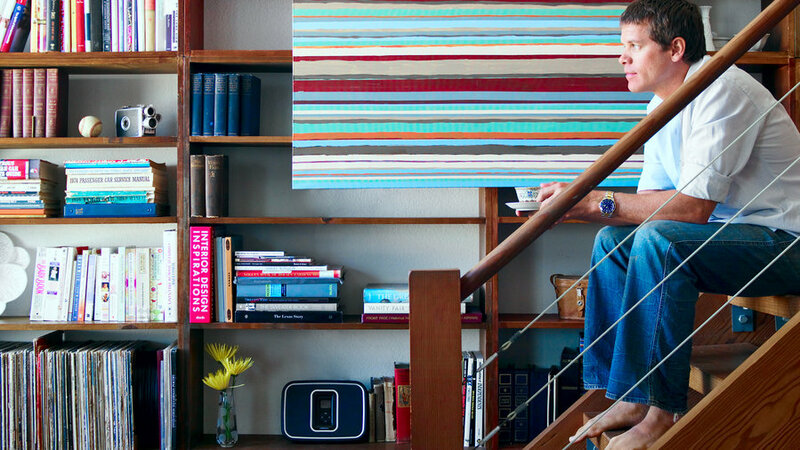 Books find a home alongside art and other treasures on these lightweight suspension shelves. The airy unit serves double duty as storage and display case. Tip: Leave books off the top shelf. Reserve that space for unusual objects so they don’t have to compete with a row of titles. 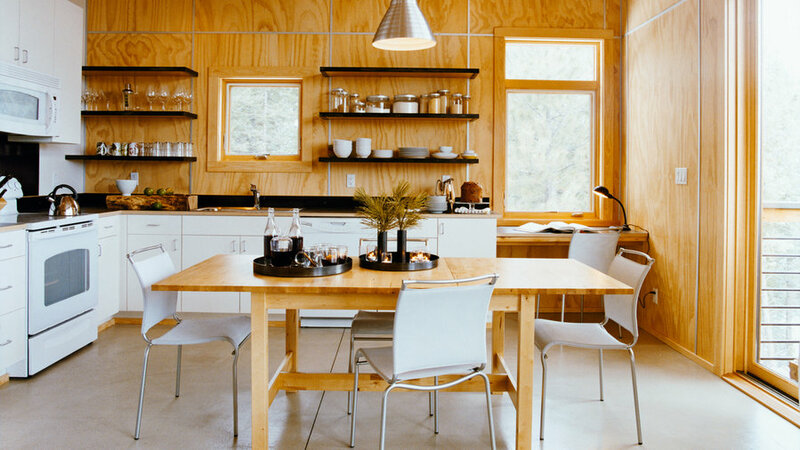 Thrifty choices in the kitchen of this northern Washington cabin include a mix of open shelves, plywood walls, and laminate cabinets. Open shelves are all about easy access, but they force you to edit. 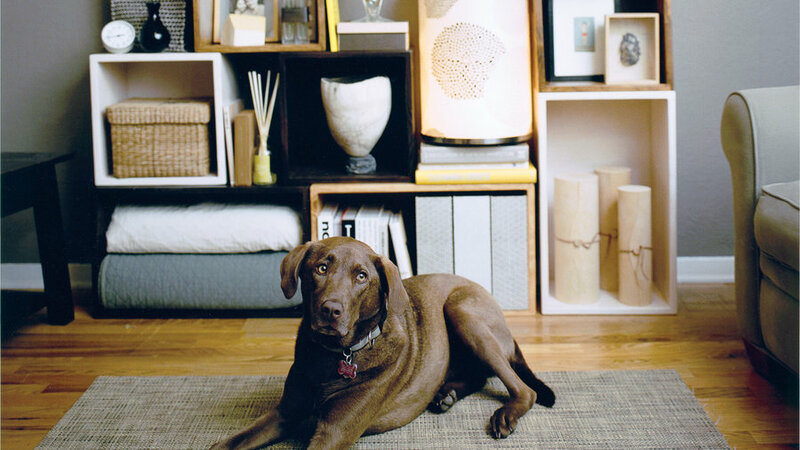 “When it’s in plain sight, you know what you’ve got,” says designer Maybelle Imasa-Stukuls. “You forget about things behind cupboard doors.” Oaktown cubby unit ($399) was from Stumasa. 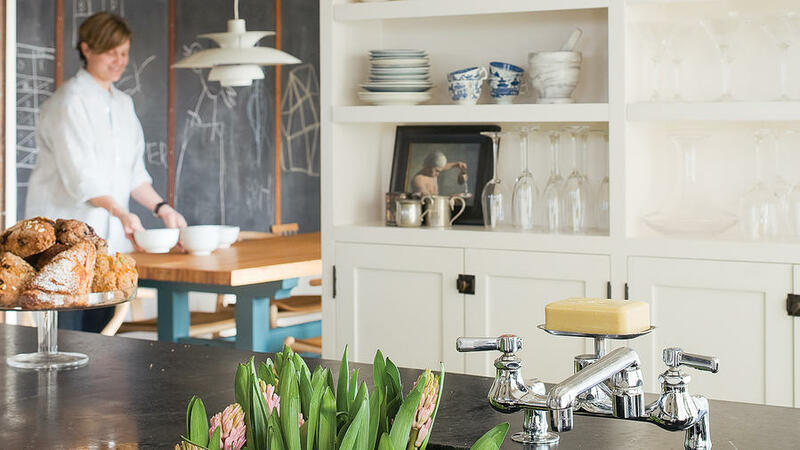 Having a storage space just off the kitchen of this home helps prevent stuff from piling up on the dining table. 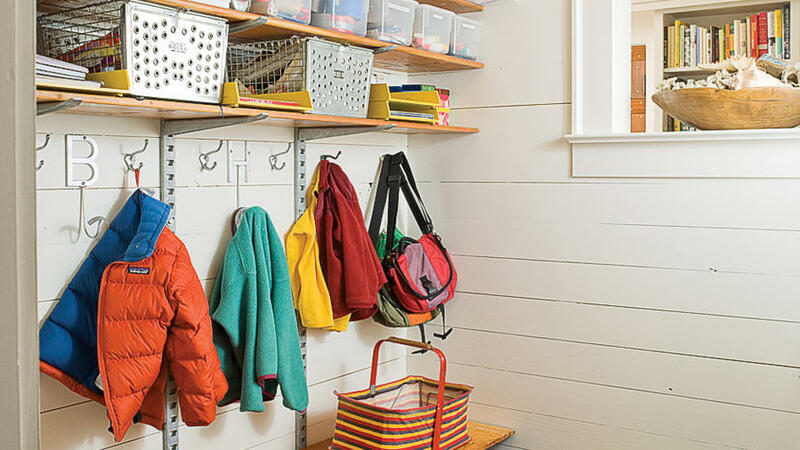 Pegs, buckets, and colored bins (from $11; ) help keep this mud room organized. The shelves were an easy DIY project using salvaged bleachers. See more about this remodeled ranch house. 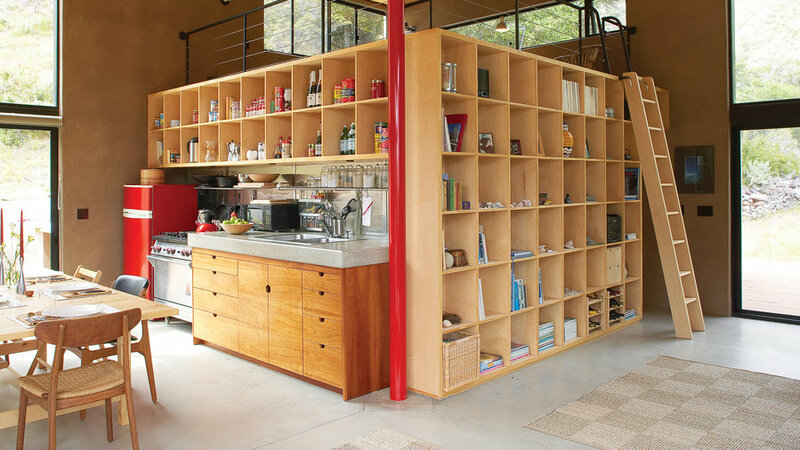 A freestanding cabinet provides open and closed storage while serving as the principal divider between the open living-dining and kitchen areas in this Portola Valley, California, home. The beverage center of our reader-voted dream entertaining kitchen keeps glasses and wine and cocktail fis within easy reach. 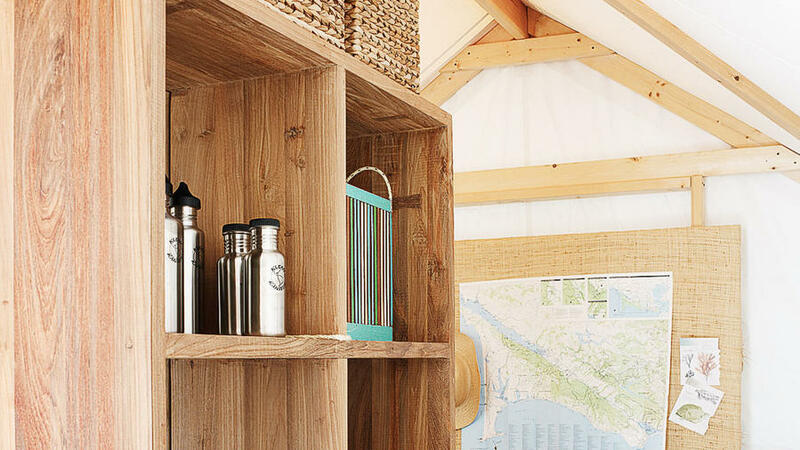 The custom shelves ensure that all the drinkware fits perfectly in place. Open shelves and mirrored backs add interest. 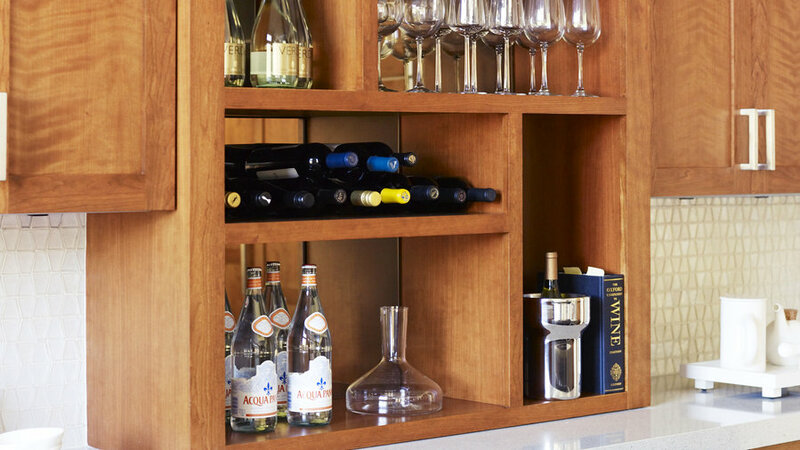 Two under-counter GE Monogram wine refrigerators each keep up to 57 bottles at preferred temperatures. Paint things white and edit down your display. It's a kind of magic trick that makes anything look more pulled together. 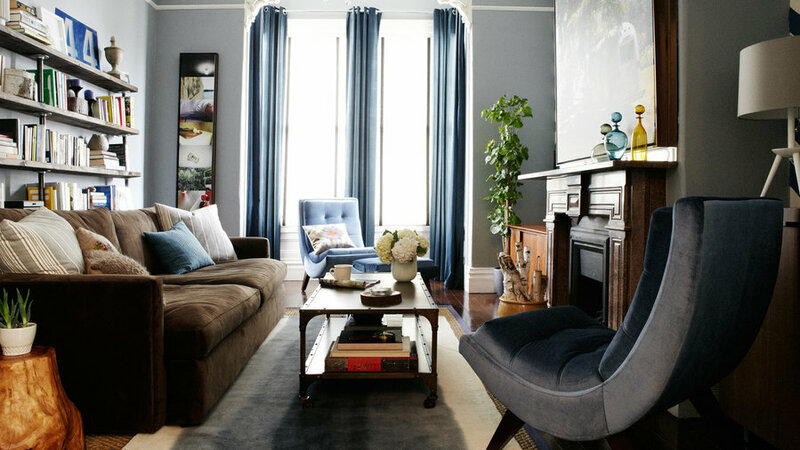 A two-story bookcase of wood and glass acts as a room divider and light chimney, bringing sunlight into the parlor of a remodeled San Francisco Victorian. 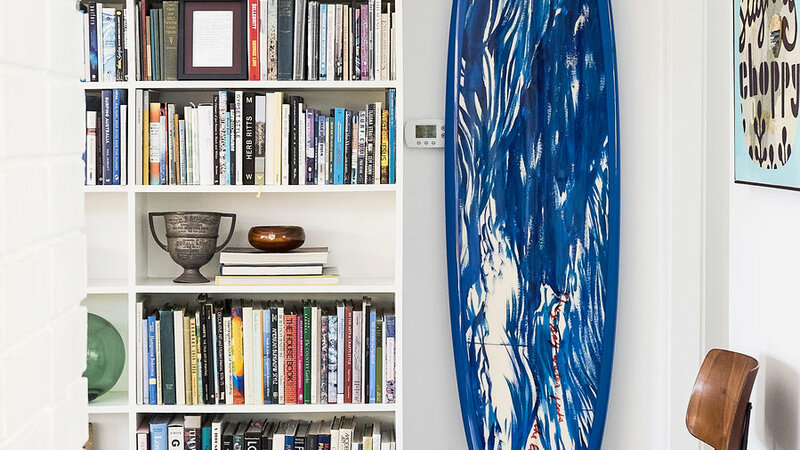 Eighteen inches of wall space may have more possibilties than you think. Designer Lotta Jansdotter put a Benno CD tower on its end and used it as shelving for books and curios. 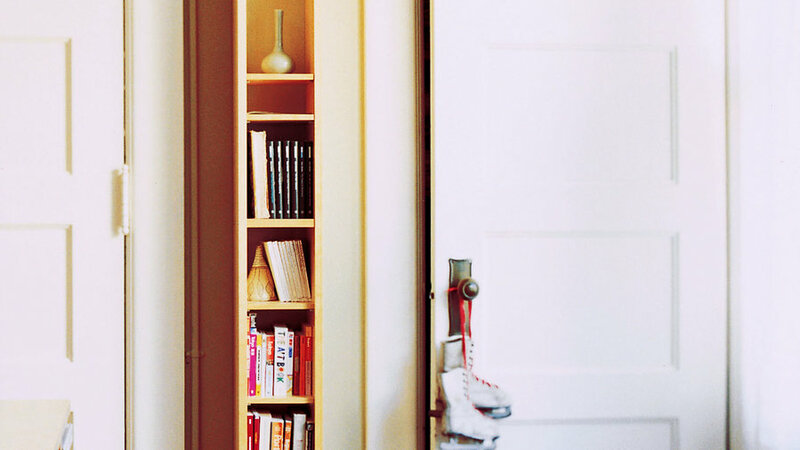 Shelves shaped like skateboards (from ) add fun to a wall of concrete wall tiles mimicking masonry. Bright towels pick up their color for another accent. Cube bookcase and bench storage by keep linens, clothing, and supplies organized in Pulaukotok's Summer Retreat Home. The freestanding open shelves make the small space feel less congested, while baskets organize clutter and store small items. A single storage wall makes this compact Seattle kitchen feel roomy. A creamy white (Bridal Veil from Behr Paints) forms the backdrop for the rich warm hue and pattern of mahogany cabinetry. Jerusalem Gold limestone slab counters and the stainless steel of the island. 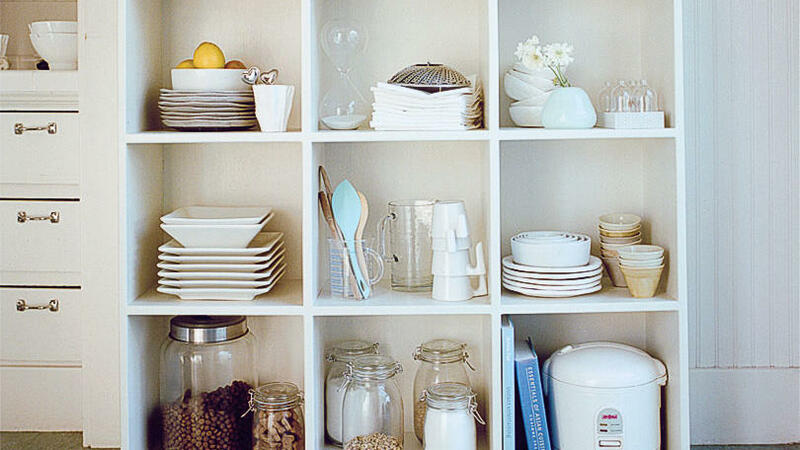 Open shelves put dishware and utensils you use every day within easy reach. 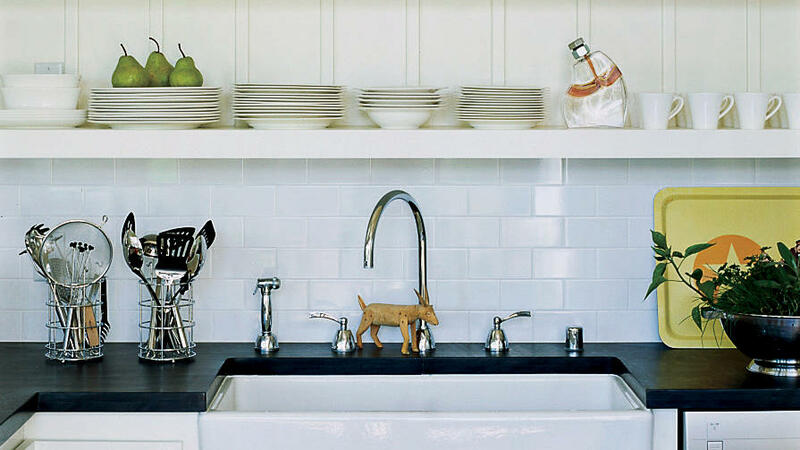 Farmhouse kitchen sink is from . The troughlike porcelain sink is wide and deep. 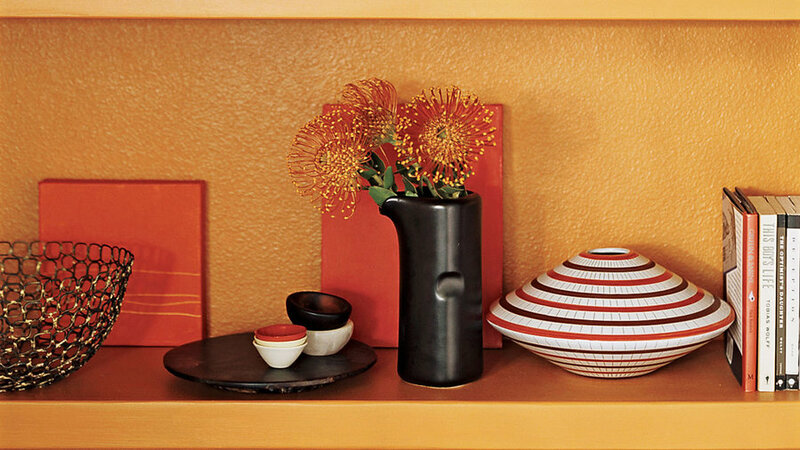 Create a colorful focal point in a small space by painting your shelves (including the back) a bright color. Here, pumpkin-colored shelves ( Deep Spice wall paint, KM3608-5) act as a backdrop to deep brown and burnt orange accessories.